The Belarusian gender debate understandably focuses on women’s rights, but in reality, men deserve as much attention. 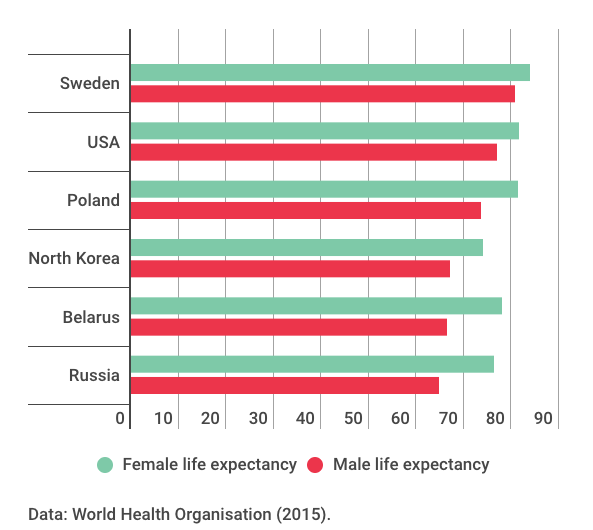 Belarusian men have a far lower life expectancy than women; lower even than North Korean men. Both men themselves and state authorities bear responsibility for this. Belarus remains one of the most alcoholic nations in the world and Belarusian men generally treat their health with indifference. This has painful consequences. Families lose a parent and a money-maker, while the state loses a taxpayer. Even before death, poor health among men leads to low productivity and hence holds significance for the economy. 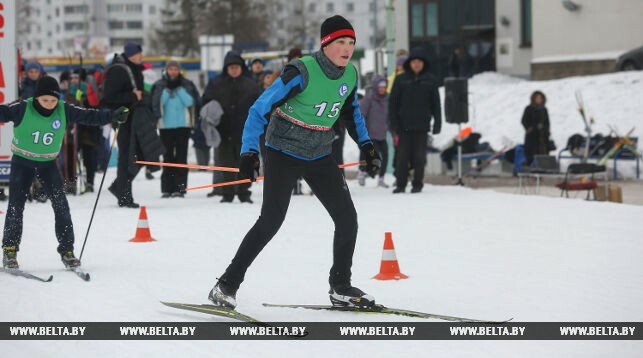 The Belarusian government undertakes some efforts to promote healthy lifestyles but it fails to do so systematically. Worldwide women live longer than men on average. 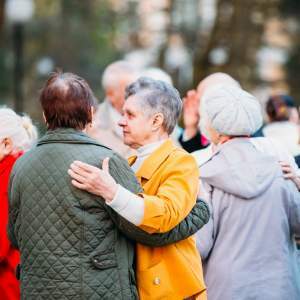 For example, in 2015, life expectancy in Sweden for women stood three years longer than for men (84 years and 80.7 respectively) according to the World Health Organization (WHO). 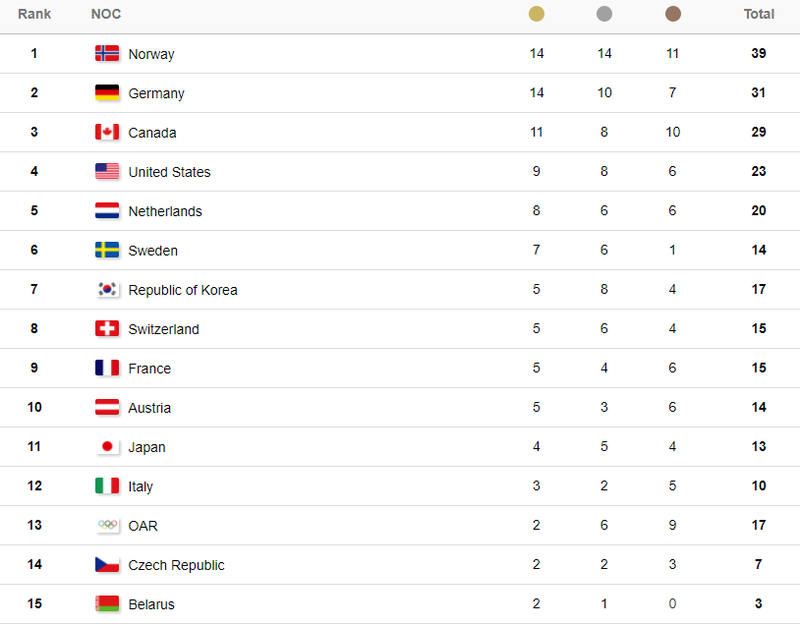 In other countries, like in the United States, this gap may be even larger (81.6 and 76.9 years respectively). Belarus differs from Western countries because it has a much larger difference in life expectancy between men and women. A Belarusian girl born in 2015 can expect to live 11.5 years longer than a boy (78 and 66.5 years). The difference turns out so great that Belarusian women rank 66th in the world by life expectancy, while men sit in 119th place. Only Russia has a larger gender longevity gap larger (76.3 and 64.7 years). But today’s reality remains much sadder and does not only affect those who have just been born. Currently, many men die before they reach retirement age, especially those who live in rural areas. In the 1990s and 2000s life expectancy occasionally dropped below 60 years for rural men. 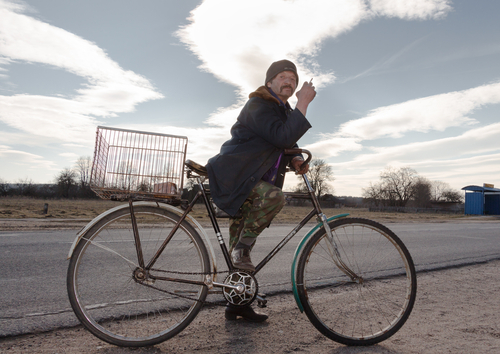 Belarusian males have lives as short as butterflies. Why do men die so early? The achievements of Belarusian men in cutting short their own lives look quite logical. 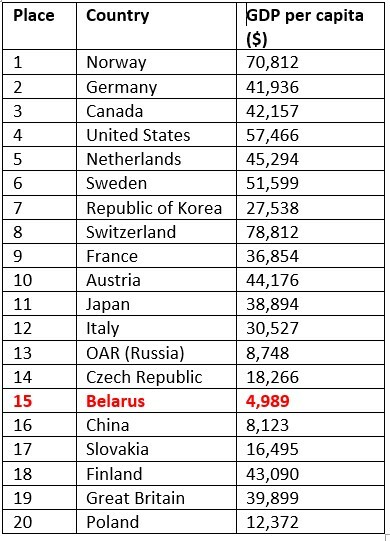 Belarus remains one of the world leaders in alcohol consumption according to the WHO data from 2014. Belarusians drink 17.5 litres of pure alcohol per capita, but that refers to the national average. Belarusian males consume 27.5 litres per capita. Meanwhile, the world average consumption is 6.2 litres. Despite government attempts to set up a programme for the prevention of alcoholism and rehabilitation of alcoholics, Belarus has so far failed to combat heavy drinking. According to the chief expert in narcology at the Ministry of Health, Belarus has 160 thousand alcoholics on record, and 85 thousand remained under preventive supervision in 2016. That equates to almost 4% of the population, although in reality one may double or triple this figure since the state authorities fail to record everyone who has problems with alcohol. Smoking remains another big reason why Belarusian men live so few years. According to a sociological study by the Belarusian state university, a third of the Belarusian adult population smoked in 2016. Most smokers are men, who often start the habit even before the time at which the statistics start taking them into account. Belarusian youth remains one of the biggest smokers in the post-Soviet space. The author tried smoking at the age of 7 and became a habitual smoker by the age of 12. In addition, Belarus has a set of further reasons determining short male life expectancy, similar to those found elsewhere in the world. For instance, men tend to avoid doctors and take bigger risks. Men more typically work in hazardous occupations, such as those associated with mining or construction. Moreover, a Ministry of Labour provision practically prohibits women from working in dangerous jobs such as blacksmith or long-haul driver. Belarusian feminists see this as discrimination. Belarusian men remain much less socialized and this influences their psychological stability. Therefore, for example, they are more likely to commit suicide – in 2016, 386 women killed themselves, while 1,656 men committed suicide according to official figures. Actually, the Belarusian authorities do not seem concerned about low male life expectancy. The issue remains absent from officials’ public speeches and so far it is difficult to find any mentions in media or academia about the matter. Yet the problem affects not only men, but it has painful consequences for society as a whole. Belarusian men earn more than women, so their loss means a significant fall in total income. Raising two children with a single Belarusian average monthly salary of $250 is difficult even to imagine. Those children without a father (or, to a lesser extent, a grandfather) will have far fewer chances of professional and personal success in life. A more common example, when a woman in retirement has to pay for housing utilities alone this amounts to around $40 per month for a small flat, which previously she shared with her husband. 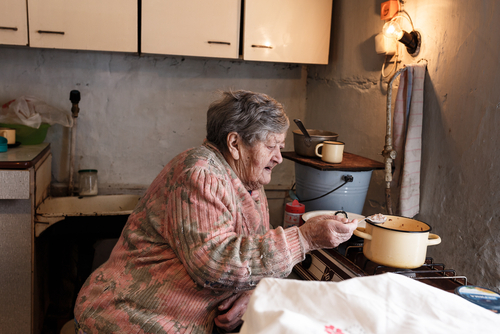 In fact, this puts the woman at risk of poverty since the average pension in Belarus remains around $150 per month. The state also loses, although some may cynically believe that the state benefits from so many men not reaching their retirement. However, in practice, this means a premature withdrawal from the labour market of qualified and experienced personnel. Moreover, men’s poor health means that their productivity remains below their potential and slows down the whole economy. It remains in the interests of Belarus to lengthen the lives of men, but the authorities seem unprepared to take steps to achieve this. The government takes half-hearted measures to promote a healthy lifestyle, such as putting social advertisements on billboards, but it fails to raise prices on alcohol and cigarettes, fearing that it will increase illegal alcohol production and smuggling from Russia. Moreover, an unhealthy lifestyle still serves as a tool of authoritarianism because it helps Belarusians forget their problems. Unless this attitude of the authorities changes, nothing is likely to prevent Belarusian men from dying early.